The truly tropical look of schefflera can work its magic in many forms - as an accent, backdrop, privacy, camouflage or container plant. It's sometimes called Umbrella Plant or Umbrella Tree. If left to grow tall, the shrub will lose its lower leaves, leaving a straight trunk and a large "top" giving the effect of an umbrella. But it's prettiest kept as a shorter plant of about 8 feet. The large shiny leaves grow in clusters and the plant takes on a rounded form that makes it ideal to hide something - the A/C, meters on a wall, or even the view into the backyard. Not choosy as to light, this attractive plant can take full sun to full shade, and grows fast and lush. 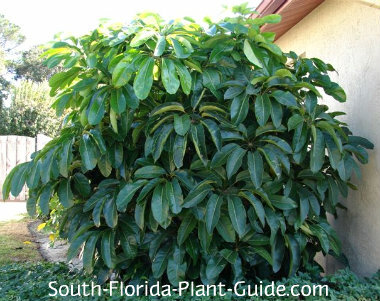 When it's grown in sun, a mature schefflera plant will bloom with huge funky red flower spikes that give it another common name - "Octopus Tree." Smaller varieties known as arboricola are very popular - the all-green and the showy variegated arboricola are both cold hardy shrubs (unlike the full-size schefflera, which is more tropical) and take sun or shade. This is a fast grower for full sun to full shade. Strong winds can cause damage so choose a protected location. Zone 10 is best, or you can use it as a container plant in Zone 9B. bringing it inside during cold weather. These plants grow big - very big - but you can keep them about 8 feet (or more, if you prefer). Add top soil or organic peat humus and composted cow manure to the hole when you plant. You can top this plant to keep the overall size in check. Do this in spring - late March or early April. Branch trim in spring if needed to shape or remove winter damage. Water on a regular basis, but don't keep the plant overly wet or plant in a moist area. Fertilize 3 times a year - in spring summer and fall - with a quality granular fertilizer. Expect to do some raking. Leaves fall pretty often (and leaf clusters tend to fall off whole) and can make a mess. Consistent watering and good health of the plant should help keep leaf drop down to a dull roar. Place these shrubs 4 to 6 feet apart. 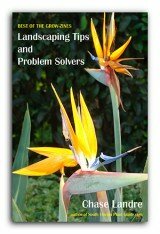 They will flush out rounded and full so give the nearest plant enough room so it's not overwhelmed. Plant 4 to 6 feet from the house. If this plant is placed too close to a building, it will not be able to flush out fully - and leaves and stems damaged by scraping against a wall will ruin the plant's good looks. Come in from a drive or walkway 5 feet or more. These are excellent container plants, and will grow happily indoors as well with the right care. 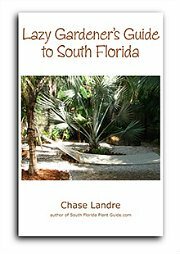 COMPANION PLANT SUGGESTIONS: In part sun to part shade, consider orange bird of paradise, croton, cordyline, African iris, dwarf tibouchina, variegated ginger, firespike, pinwheel jasmine, dwarf powderpuff, and foxtail fern.